Description, Situation & Vue de la Ville de Mexique, des Deux Lacs sur lesquels elle est Batie, du Grand Temple de cette Ville, des Sacrifice d'Homme qu'on y Faisoit, de l'Idole des Mexicains, de Leurs Jeus Divertis semens, Coutumes, Superstitions & Atures Usages Pratiques Parmi Eux. 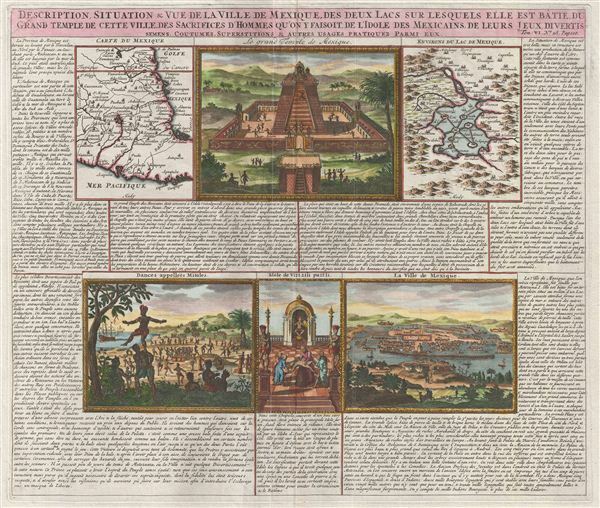 An exceptionally beautiful example of Abraham Chatelain's 1719 map and view sheet focusing on Mexico. This sheet combines two maps and four engraved views with extensive text describing the lands and customs of Mexico. The maps, appearing in the upper right and left quadrants detail central Mexico and Mexico City. The more general maps, located in the upper left, is centered on Mexico City and details from the Gulf of Mexico to the Pacific and from the Rio de Palmas to Acapulco. The second map, in the upper right, focuses more specifically on Mexico City, revealing the ancient Lake Texcoco, and the cultivated islands that once housed the great Aztec capital. Between the two maps a large view depicts a typical Aztec temple complex. The lower views detail, from left, traditional Aztec dances with a Spanish galleon in the background, human sacrifice, and a general view of Mexico City combining european and Aztec architectural elements. The extensive surrounding text, in French, attempt to describe the customs, peoples, resources, and geography of Mexico. Prepared by Abraham Chatelain and engraved by Bernard Picart for inclusion in his 1719 Atlas Historique. Chatelain, A. H., Atlas Historique, (Amsterdam: L'Honoré & Châtelain), vol 4, 1719. Very good. Orignal centerfold. Wide clean margins. Phillips, P.L. (Atlases) 548, v.6, no.28.